The FDA’s new guidance document, Reprocessing Guidance for Industry and FDA Staff issued March 17, 2015, outlines a summary of changes to the FDA’s May 11, 2011 reprocessing draft guidance. Based on the content and addition of Appendix E, this appears to be a response by the FDA to recent issues with endoscope reprocessing. It is, however, important to note that many of the concepts highlighted in the new guidance document have been incorporated in current Technical Informational Reports and Standards, industry practice, and laboratory tests for years, and this guidance reaffirms FDA recommendations and expectations. The following highlights some of the ways the new guidance document differs from the May 11, 2011, version (Draft Guidance for Industry and FDA Staff: Processing/Reprocessing Medical Devices in Health Care Settings: Validation Methods and Labeling). For the complete document, visit www.fda.gov. The majority of changes to the document include rewording, new information, and additional details about content highlighted in previous iterations of the 2011 draft guidance. These changes include expanded endoscope reprocessing guidance in Appendix E.
Specific medical devices that FDA has identified, which pose a greater likelihood of microbial transmission, and represent a high risk of infection in the event they are not adequately reprocessed. Devices listed in the appendix include the Product Code, Device Name, and Regulation Number. Reprocessing instructions not only need to be validated, the validation data must be equivalent or better than predicate devices. Considerations for most scope models and accessories are now included. Specific guidance for laparoscopic instruments, accessories, and design features are also included (see Table 1). This new section addresses the FDA’s concern about the, “evolution towards more complex, reusable medical device designs that are more difficult to reprocess.” It specifically talks about the need for medical device engineers to think about the cleaning, disinfection, and sterilization reprocessing instructions when designing medical devices. FDA recommends engineers consider including flush ports and cleaning accessories made for the device. This is also mentioned in a number of other sections of the revised guidance. Many additional references were introduced to the guidance. Section B. 3. contains a reference to ANSI/AAMI ST81/Ed.1, “Sterilization of medical devices – Information to be provided by the manufacturer for the processing of resterilizable medical devices” as well as a couple of other pertinent references. Section C. 2. specifies many FDA and AAMI guidance documents on human factors that are relevant to how healthcare facilities manage and process reprocessed medical devices. Section F. includes a reference to the newly published AAMI TIR34: 2014, “Water for the reprocessing of medical devices,” which is an important consideration for ensuring the correct water quality is used in all steps of reprocessing in the clinical setting. FDA has now specified that at least two quantitative residual markers should be tested in a cleaning validation. These tests should measure clinically meaningful levels of the clinically relevant test soil and be measured against predetermined endpoints. While Nelson Laboratories has recommended testing two quantitative residual markers for cleaning validations for many years, this is the first time FDA has incorporated this number it into their guidance document. Of key importance is the language related to visual inspection of reprocessed devices. A couple of changes the new document makes to the suggested validation process include the addition of visual inspection of the inside of the device and definition of additional positive and negative controls. Section VIII. 3. A. specifies that visual inspection of both external and internal surfaces should be performed during validation. Section VIII. 3. B. specifies device and sample controls of both positive and negative controls. This does not really change how Nelson Laboratories currently performs these validations. 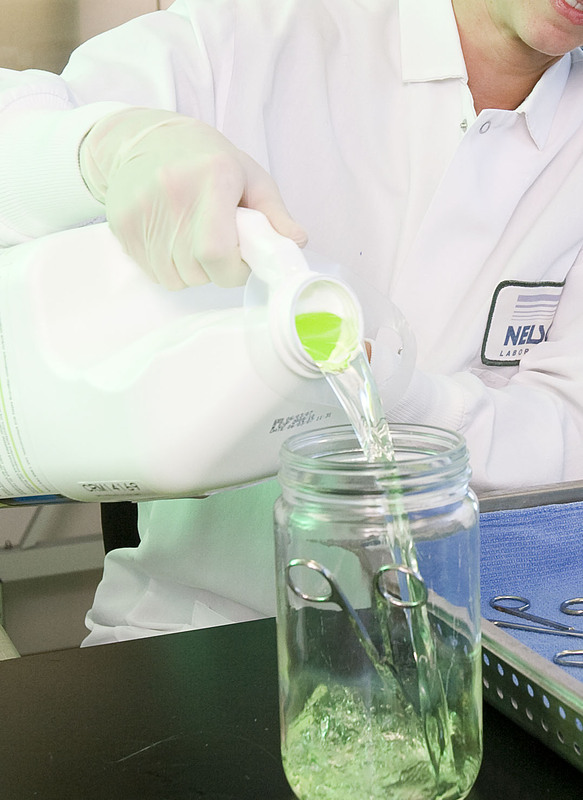 For more information about the reprocessing of reusable medical devices, please contact Nelson Laboratories’ reusable device testing experts Emily Mitzel, Alpa Patel, or Nick Workman at (800)-826-2088, or servicecenter@nelsonlabs.com.